Located in Kamata, this hotel is 1.2 mi (1.9 km) from Tokyo Bay and 2.4 mi (3.9 km) from Shinagawa Aquarium. Tokyo Institute of Technology and Sengakuji Temple are also within 6 mi (10 km). Tokyo Kamata Station is only a 3-minute walk and Tokyo Keikyu Kamata Station is 7 minutes. Laundry facilities, a 24-hour front desk, and a TV in a common area are available at this hotel. Free breakfast and free WiFi in public areas are also provided. All 181 rooms offer free wired Internet, refrigerators, and LCD TVs with digital channels. Other amenities available to guests include down comforters, hair dryers, and phones. A complimentary breakfast is offered each morning. Wireless Internet access is complimentary. 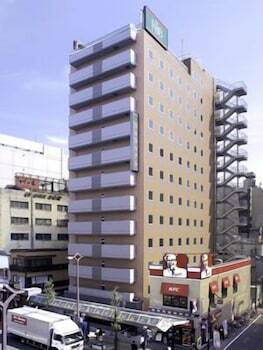 This Japanese business hotel also offers laundry facilities, a television in a common area, and an elevator (lift). A complimentary breakfast is served each morning between 6:30 AM and 9:30 AM. Start your morning with a free breakfast, available each day from 6:30 AM to 9:30 AM.